The Hermine is an ideal instrument for students interested in a high quality, light-weight harp. It has an impressive Celtic sound and a practical range. 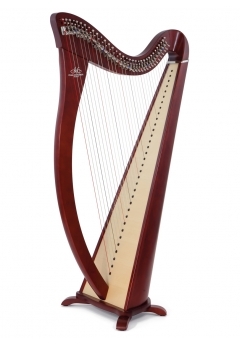 Created in 2003, in response to requests from harp teachers, the Hermine is a classic Celtic harp. Its size and weight make it particularly suitable for younger harpists. Equipped with "Alliance" strings, it combines the roundness and strength of the gut string sound with the robustness and stability of synthetic strings. Light, easy to handle and of impeccable quality, the Hermine nonetheless remains accessible, thanks to its very attractive price. Material used: maple and beech for the body, spruce for the soundboard.